A complete note pad application with nice features like web searching is presented by XDA member xdaid. New version 2.56 has some improvements such as the ability to edit up to four different text files in the same session, switch from one tab to another with just one click, ability to add or remove tool bars at any time, and more. The application will run on Windows Mobile devices with VGA resolutions and over, running WM 5 and up. 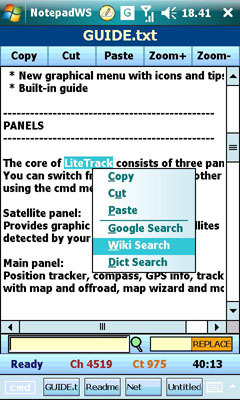 [APP] NotepadWS – Tabbed text editor with online Search feature – Big update! NotepadWS is a notepad-like application with TABS feature and some interesting tools such as the WEB SEARCH. it could be a good way to perform your search quickly and easily! Edit up to four different text files in the same session. Switch from one tab to another with just one click. Ability to add or remove tool bars at any time. Online search of selected word or text; google search, wiki search, dictionary. You can find more information in the application thread..